Ramen competition on Sawtelle is fierce… Add one more to the mix. A large banner over the space at 2012 Sawtelle Blvd. 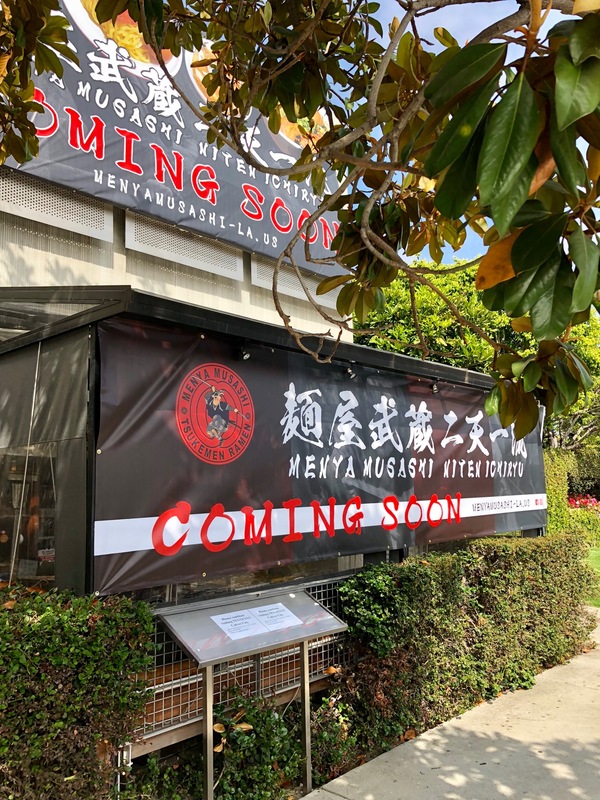 lets us know that a new noodle joint is on the way. Hailing from Shinjuku and named after a 17th century samurai, international chain Menya Musashi will soon be dishing their signature ramen and tonkotsu broth. Sachi Bringing Coffee And More To Centinela Ave.
A big wooden sign informs commuters that coffee is coming soon to the storefront at 4574 Centinela Ave. in LA. Upon closer inspection, the name of the new shop will be Sachi. Their website promises a “welcoming space influenced by Japanese culture and values- devoted to offering high quality coffee and food, stylish vintage clothing, healthy potted plants, and local artisan products”. Just in time for a hot summer… Since I first told you about indications of a new icy treat shop moving into the commodious space at 11813 W. Santa Monica Blvd. in LA, a great many of you have been following its progress. Helados La Michoacana has recently thrown open its doors for business. A cursory peek inside reveals what looks like miles of wrap-around freezer counters loaded with every imaginable ice cream, frozen pop, and juice.